Consumers across the world consider PLB’s as – Value for Money, Reasonably good product quality, a good alternative to National Brands. On the contrary, the Indian consumers understanding of PLB is low. Hence for Tata Trent, the brand problem was rooted in the category. The PLB faces a perceptual barrier of being a ‘cheap knock-off’ of a national brand. In addition, PLB’s are perceived to be less authentic, risky and less aspirational. Hence our task was to refresh the perception to arrive at the desired position, i.e. relatively low priced and perceived high product quality. Trust is an inherent value that could come with an endorsment of TATA for the brand. What we needed to create was a perceptual shift in the way PLB’s are seen by adding the values of great taste and aspiration to the core of the brand.What is it that a national brand promises to offer and a PLB cannot except for its reach and milage. 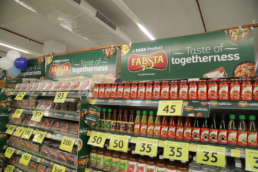 Does a PLB has a potential to beat a the mainstream FMCG brands in theemerging Modern retail where the consumers can touch and feel the brands? These and many such thoughts had to be deep dived into before we embarked on the creation. We started with rigorous research to understand the consumers expectations, perceptions and readyness for a great food brand. Based on the consumer learnings and after multiple rounds of thought exhanges and between the key stakeholders at Trent a definitive positioning for the brand was articulated. – assurance of best quality ingredients for the products – Goodness/Wholesomeness, hat brings out the true essence of ‘wholesomeness’. 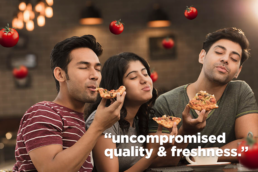 Delivering this wholesome experience at a great value was the need gap that we saw the brand fullifing for the consumers. Once the brand foundation was in place, it was sheer happiness to manifest the Brand values into the mose coveted brand assets. concepts including a logo and a colour palette that formed the new brand identity and captured the brand essence. The suggested positioning i.e. assurance of best quality ingredients for the products – Goodness/Wholesomeness, formed the foundation of all the design and creative routes that were explored and presented. 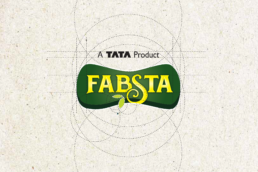 Freshness is the core of the brand Fabsta. We derived the inspiration from Nature, the farms and fields where the story of freshness begins. The dark green Logo form is acquired from the contours of vast fields merging into each other representing abundance. A Modern Classic Font type has been used for the white logotype to give it an ageless look with the ‘S’ extending and cutting across the main form to convey that Fabsta goes beyond boundaries to source products that are exceptional in quality and taste. The leaves depicted in Light Green shows the products are rooted in freshness with the exact taste of the ingredients, which nature meant to provide. Taking the idea of freshness ahead, an abstract form of leaf is the visual hook for the entire range of packaging. The background is treated with graphics depending on the product category. The ingredient/product depiction is showing abundance. 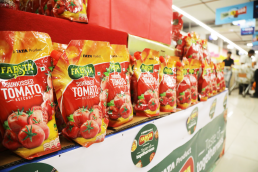 To emphasize the brand positioning furthermore a comprehensive “Goodness Guarantee” logo was created for the packaging as a seal of assurance of great taste and quality. Finally, we prepared a brand guideline and implementation control manual in the form of a navigable PDF format. We are glad that we are elemental in nuturing and growing the brand FABSTA that we have created with much thought and passion !